Express your love for the cute looking golden doodle dog with this wonderful weathervane in the shape of a golden doodle dog. Ornament size: 21in. X 9in. 4 Sided Mount: The four sided mount is made for mounting to a 4 or 8 sided cupola or gazebo. This mount comes with a 12" rod(not pictured). Each leg of the mount measures approximately 5 3/4" long from the center of the upright tube. Deck Mount: Mount to a flat board i.e. deck board. It is approx. 3" x 3" and includes the 12" rod(not pictured). Garden Mount: 60" mount includes stabilizing ground stake. The garden mount ships in two pieces and must be screwed together upon arrival. Post Mount: The post mount or (side mount) will mount to the side of a fence of vertical board. It is approx. 3"x 3" and includes the 12" rod(not pictured). Roof Mount: Our roof mount is adjustable, but is made to a 4/12 roof pitch. It includes a 12" rod. You can add a sign that spells out a warm greeting or a whimsical message that will surely bring a smile to the face of your friends or visitors. The sign is mounted underneath the directionals and is color coordinated with your choice of either satin black or copper tone vanes. 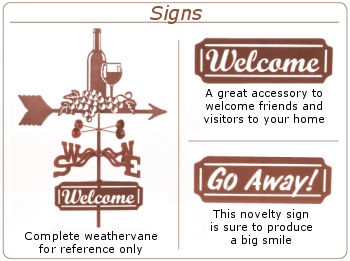 There are two signs available "Welcome" and "Go Away!". The signs add a nice custom touch to any vane selection. 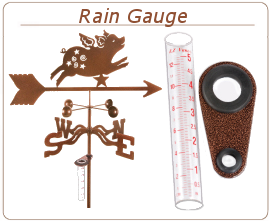 The rain gauge vial is custom made in the USA for the EZVane weathervanes. The rain gauge bracket is made of heavy 14 gauge steel and finished with our unique durable three step coating process. Rubber grommets securely hold the gauge to the weathervane pole while at the same time preventing damage to the glass vial. Replacement glass vials are available. WHY CHOOSE AN EZ VANE STEEL WEATHERVANE? Why choose an EZ Vane steel weathervane? It's easy...QUALITY! Our three step finishing process is unique and we manufacture all our products in Grand Rapids Michigan right here in the USA. Step 1: Yellow zinc chromate plating. 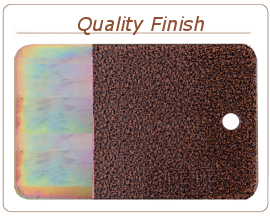 Better adhesion, durability and rust prevention. Step 2: Polyester copper vein. Baked on for a hammered finish look. Step 3: Clear Polyester powder coat. Baked on to protect against UV rays and fading.